Richard Sorabji presents a fascinating study of Gandhi's philosophy in comparison with Christian and Stoic thought. Sorabji shows that Gandhi was a true philosopher. He not only aimed to give a consistent self-critical rationale for his views, but also thought himself obliged to live by what he taught-something that he had in common with the ancient Greek and Christian ethical traditions. Understanding his philosophy helps with re-assessing the consistency of his positions and life. Gandhi was less influenced by the Stoics than by Socrates, Christ, Christian writers, and Indian thought. But whereas he re-interpreted those, he discovered the congeniality of the Stoics too late to re-process them. They could supply even more of the consistency he sought. He could show them the effect of putting their unrealised ideals into actual practice. They from the Cynics, he from the Bhagavadgita, learnt the indifference of most objectives. But both had to square that with their love for all humans and their political engagement. Indifference was to both a source of freedom. Gandhi was converted to non-violence by Tolstoy's picture of Christ. But he addressed the sacrifice it called for, and called even protective killing violent. He was nonetheless not a pacifist, because he recognized the double-bind of rival duties, and the different duties of different individuals, which was a Stoic theme. 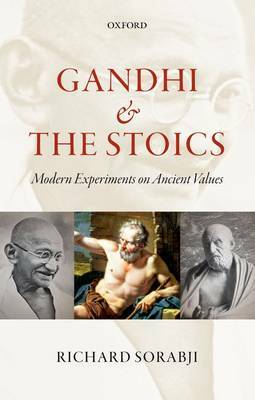 For both Gandhi and the Stoics it accompanied doubts about universal rules. Sorabji's expert understanding of these ethical traditions allows him to offer illuminating new perspectives on a key intellectual figure of the modern world, and to show the continuing resonance of ancient philosophical ideas.